The BTO Swallow Roost Project ran from 2002 to 2006 as part of a major EURING (European Union for Bird Ringing_ project on Swallows. Swallows being ringed. More information on the EURING project is available on the EURING website www.euring.org. Ringers in Britain & Ireland concentrated on the pre-migratory phase of the Swallow's life, counting and ringing Swallows at pre-migratory roost sites from shortly after they are formed until abandonment of the roost. Ringing took place every 7-10 days. In addition the birds using the roost were counted during every catching session. In order to make the data comparable across Europe ringers caught and accurately measured up to a hundred birds each visit (minimum of 30 birds). To allow the catchment areas of roosts to be identified, ringers were also encouraged to ring nestlings during the breeding season. Over 53,000 juvenile and 6,600 adult Swallows were ringed at roosts. Analysis of these data is now complete and the results have been written up as two papers. 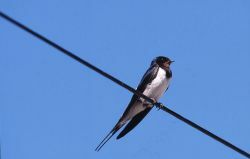 The main paper, on fattening strategies of British & Irish Swallows will be published in Ringing & Migration in 2011*. A second paper on differential fattening in juveniles from early and late broods will be submitted shortly. The results showed that the pattern of fuelling in British & Irish Swallows mirrors that of Swallows caught at roosts in Italy and Spain, although British & Irish Swallows begin fattening earlier, around the middle of August, and put on less mass than birds roosting in southern Europe. Adults gained more mass than juveniles, and there is also evidence that juveniles from late broods gain less mass than those fledging earlier in the season, which may reduce their chances of surviving the migratory journey. More results are detailed in the Swallow Roost Project Newsletters, which can be downloaded using the links below. (Note you will need Adobe Acrobat Reader- download link at bottom of page).